When one considers just how many excellent Beethoven recordings are on the market, you have to possess a great deal of confidence in order to release yet another Symphony Edition. In the present Beethoven Symphony Edition, a wind of change blows through the lofty halls of the Viennese Classic that might well be capable of dethroning some of the monumental recordings. 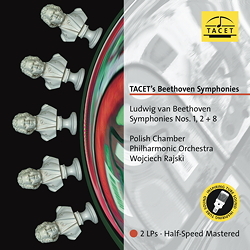 The reason for this does not merely lie in the phenomenal sound of the two early symphonies which blossom out fresh and new, but in the dauntless and daring approach of the performers: Wojciech Rajski and Polish Chamber Philharmonic Orchestra play Beethoven joyfully and rousingly, but never luridly. The musicians know how to amalgamate the explosive core and its gentle transformation and in doing so achieve a clearly defined and rich sound which will delight the listener. Special care and attention is given to the recording and the reproduction of the wind passages whose full-bodied intensity is reminiscent of Otto Klemperer’s recordings in the Fifties and Sixties. Rajski indulges in brisk tempi in the outer movements, while in the volatile Finale of the Second Symphony in particular, all virtuoso forces are let loose. In the Eighth Symphony, whose pulsating rhythm in the second movement is said to have been inspired by Mälzel - the inventor of the metronome, the animated playing of the Polish musicians unleashes their rhythmic, metrical and not least humourous vigour. Now that these fiery symphonies are available in a complete edition from TACET, it is definitely time for discerning listeners to add them to their collection.